Not all my knits turn out well. The really bad ones get “frogged,” and no one is the wiser as the yarn gets a second (or third) chance at becoming something I’ll wear or can be happy gifting to someone else. However, my attempt at Purl Soho’s White Caps Cowl falls somewhere in between. I finished it, and I’ll probably wear it, but I just don’t love it. I didn’t want to spend the big bucks for the kit, so I looked around for suitable substitution yarns. My mom gave me a lovely shiny yarn and super soft alpaca, but together they lacked the subtle undulation that a thick-thin yarn gives. I finally made the cowl with the shiny yarn from my mom and the recommended slubby cotton from the original pattern, but the shiny yarn is just too heavy and the whole project hangs limply. It lacks the frothy lightness of Purl’s version. (My White Caps cowl on Ravelry) Sometimes you can substitute yarns and sometimes you just can’t. This was one of those times. I promised the airplane knitting that I changed halfway through, and here it is. This was definitely worth re-doing. I like the more subtle striping better with this one, and the thick to thin design works well with those stripes too. I used the same gradated yarn (Wolle’s Color Changing Cotton) as in the shawls in the previous Knit Night post. This Elfe tee used two skeins: the first is the Mystique color way, which gradates from navy to grey to chocolate brown. The second skein is called Tardis and goes from the same grey, to medium blue, to navy. the stripes get a little funky in the middle where the greys switch places, but that’s part of what I like about this. I was very curious to see how two graduated yarns would work together, so this was lots of fun. Next up is a shawl that will use the black to brown to grey that I jettisoned from this project, paired with a grey/purple that should be subtle but nice. Slightly more technical Elfe details are on my Ravelry post here. I’ve been lucky enough here in Charlottesville to become friends with a lovely woman who makes beautiful color changing cotton yarn. Over the last few years I’ve knit a half dozen things with this yarn and have plans for a half dozen more. 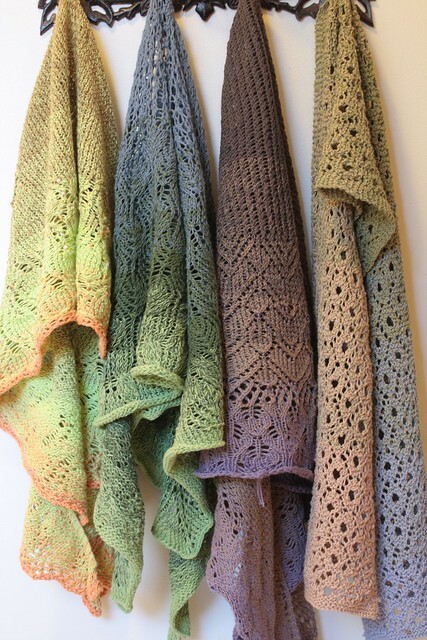 Today seemed like a good day to take a group portrait of my shawls. I’ve made two others as well, but they are for my mom and my sister, so they don’t live with me. All those gradients look so pretty hanging in a row. I’ve been joining “Wolle” at the local yarn and wool festivals to help out at her booth. It’s great fun to show off the yarn and to help people choose just the right colors. The Elfe sweater in the last Knit Night post is also knit from Wolle’s yarn. I hope to have it finished in time to wear to the Powatan Fiber Fest at the end of this month. So far, so good — it should be next week’s post!